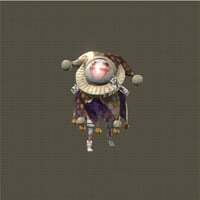 Zombie Clown is an Peculiar Machine enemy in NieR: Automata. "This machine lifeform, which resembles a clown, has assimilated stamps into its body. It lures victims with offers of play before spewing an unknown liquid from its mouth that is toxic enough to melt the skin of androids. Upon defeat, it offers thanks for playing with it." what caused them to go nuts? One of the robot that is hiding in the alley says they just snapped, he wasn&apos;t effected, why? The first time I went down where these dudes spawned I saw the flickering lights and I knew some spooky biz was about to go down. These guys were actually really creepy.